Nine Trimpley sailors brightened a dreich ( that’s raw and grey ) day to compete for the 2017 MIllennium Trophy. It was a close run thing for the Laser fleet with Ian Davies, Paul Powell and Eddy Hillman sailing the third race for the honours. 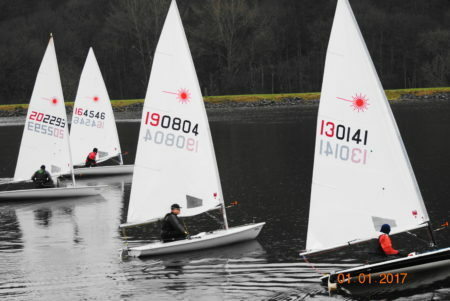 The Laser Main was won by Paul Powell who pulled out a commanding lead in the deciding race. Ian Davies took the Handicap trophy. The GP14 of Keith Budden and Ben Roberts took the GP Main and Handicap and it was good to see a Solo amongst the contenders. Well done to all sailors, race crew and spectators who lightened up an otherwise grim day.